INDIANAPOLIS — Coding is the language and a driver of the economy's future. STEM education and computer science is ingrained into the work for many companies now across the world, Amazon being one of them. According to the Bureau of Labor Statistics, by 2020 there will be 1.4 million computer science-related jobs available and only 400,000 skilled graduates to fill those jobs. That is why Amazon partnered with curriculum provider, Edhesive, and created a long-term approach to make sure more students have access to this education so that in the future these students will choose a career in this field and have the tools to succeed in the industry. The program is called Amazon Future Engineer. 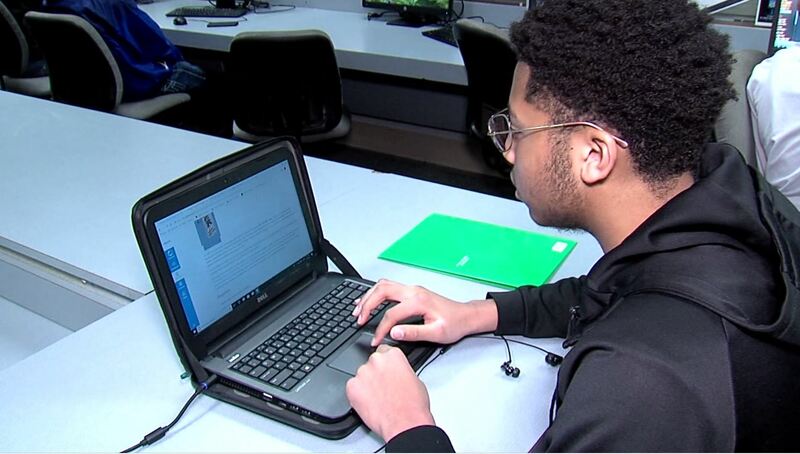 "What I am trying to do right now is make custom controls, so double jump, double speed, all of those types of things," Solomon Burks, a junior at Pike High School, said. "Basically what they want us to do is use this scratch program to try to code this controller for Mario-type game." Basic coding, that is the lesson plan for Burks' computer science course at Pike High School. His class in one of 23 Indiana schools that are using, or will be using by fall of this year, the Amazon Future Engineer course. Amazon Future Engineer is a four-part, kindergarten-to-career program aimed at educating 10 million students from underprivileged and underrepresented communities each year in computer science and coding. "At first I wanted to be an engineer, but when I got my hands on this course, it kind of made me go into the computer science path," Burks said. The program is designed to make this type of learning fun and interesting for high school students. "It is important for everybody to be learning this stuff," Chad Bobb, the computer science teacher at Pike High School, said. "Computer science is more than just coding, it is also the user experience." Bobb has been teaching this subject for nearly a decade, but this is the first year with the Amazon Future Engineer curriculum. "Technology is huge right now, with the advances, driverless cars, and things like, so it is a good idea for everybody to have this understanding," Bobb said. Amazon provides funding for the prepared lessons, tutorials, and professional development for teachers, fully sequenced and paced digital curriculum for students, and live online support every day of the week. "Also the skill level of the teacher, there [are] a lot of teachers that say they can't teach that, they would but they can't," Bobb said. "But they can. You can, with these kinds of programs. It helps to build the confidence of the instructors so that they are more confident and able to help the students." Bobb says the Amazon Future Engineer curriculum is aimed to help the teachers teach this class. "It is a huge, huge effort by Amazon in order to increase awareness and accessibility to computer science, laying that foundation," he said. "Their benefit, these are their future employees for Amazon." The program also provides an opportunity for a bright future for Hoosier youth. "It doesn't always work all the time, that is the beauty of computer science," Burks said. "I think it's pretty cool and I encourage others to take it in the future"
The average computer science major makes 40 percent more in lifetime earnings than that of the average college grad, and three times more than the average high school graduate, according to the Bureau of Labor Statistics. The Amazon program also provides kindergarten through eighth grade students with computer science education. There are also scholarship and internship opportunities available. If parents are interested in the Amazon Future Engineer Program for their children, but it is not available at their school, parents can check out the Amazon Future Engineer website as many of the programs are suitable for individual learners. There are also grants available to cover the Amazon Future Engineer Programs at schools.